We spread our compost on the winter stockpiled pasture a few weeks ago (Sep. 9th). The compost pile was the end result of offal from 1,200 chickens, 3 pigs and a goat along with a year’s worth of humanure and kitchen and garden waste. That pile was built over the course of a year then aged for another year. At the end of that time my eldest son and I shoveled it into the manure spreader sifting out bits of trash (string, bag tops, wire and one pig skull) then I spread it on the fall stockpiled pasture. We spread the compost to help boost fall fescue growth as well as to help innoculate the soil. 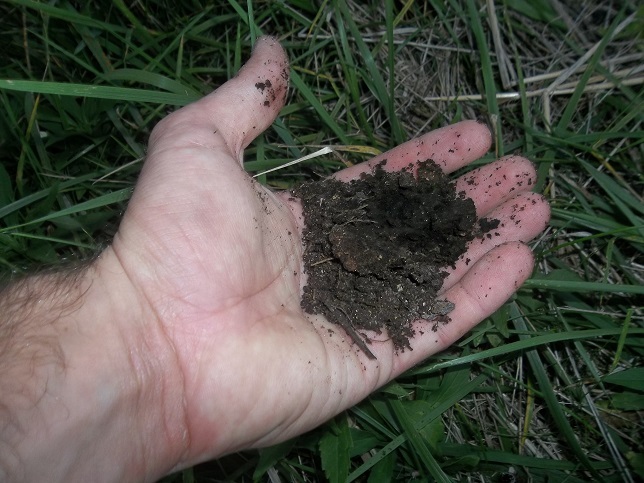 Isn’t it interesting that the first step toward building healthy soil is to increase the soil bacteria? Kinda makes one rethink using anti-bacterial soap. The compost spread in a thin layer across a couple of acres. If things go as planned, I’ll get the pigs moved and I’ll spread another layer from that cow/pig bedding on the field as well. Not only will it give the stockpile an extra kick of growth, it will help the stockpile tolerate the cold weather. This practice was emphasized in several books including Salatin’s $alad Bar Beef but also by Stacey last year on her blog. Thanks for the reminder Stacey! This entry was posted in Children on the Farm, Pasture Management. Bookmark the permalink. I love compost. A compost bin was the first thing I build when we started our urban farming years ago and I have continued. Such a wonderful deal turning waste into good. I agree. Also, there are degrees of skill in creating compost but you can’t screw it up. no matter how the plants did this year, next year’s garden will always be better because of this year’s compost.